You can serve this pretty spring dish either hot or at room temperature. The more you crowd your plate with beautiful vegetables, the less room you have for bad fats and refined carbs. A little bad fat and carb is desirable, but I’ve found that an excellent way to avoid overdoing it is by learning to be a fabulous vegetable cook. That’s not so hard, especially this time of year, when good things are bursting forth from our still somewhat productive earth, beckoning to be cooked and eaten. I like going to the market and simply selecting vegetables by color, and then coming up with a way to present them, all together, in a palate of visual and savory pleasure. This week I picked up snap peas, shell peas, little baby fennel, and first-of-the-season zucchini, all in varying shades of green that really caught my eye. And I grabbed basil, parsley, and tarragon because there they were there. I decided to do a little sauté of pretty green things and make a pesto of green to go with it. Now I had a plan. 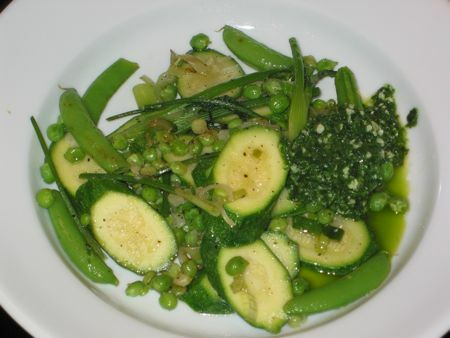 I love pesto, but I felt that for a pesto to make sense as a sauce for my spring vegetables, it had to be gentle. Here’s a pesto with a difference. I’ve left out the cheese (no cheese? ), making it lighter, more directly herby. I’ve also used a mix of spring herbs—basil, Italian parsley, and tarragon—for a more complex flavor than basil alone would provide me. Boy, was this good. I made it an entire meal, with a slice of crusty Italian bread and, just to make my pork quota for the day, a few slices of prosciutto. You could instead serve it as a side, along with a piece of grilled wild salmon seasoned with just a squeeze of lemon juice (in which case this recipe would serve four). A simple white Puglian wine, a mix of Fiano and Greco grapes, by a producer called A-Mano, is something I recently came upon in my wine shop. I knew this producer from a trip to Puglia some years ago, but I was familiar only with their Primitivo, a rich red. A-Mano’s Fiano-Greco is a great warm-weather wine and a very good match for all the fresh green tastes in my vegetable medley. It’s gentle, not too acidic, very easy and refreshing (and inexpensive as can be). Fill a small saucepan with water, and bring it to a boil. Drop in the herbs, and blanch for about 30 seconds. Scoop the herbs from the water into a colander with a large strainer spoon, and run cold water over them to bring up their color. Drain well, and then squeeze out as much water as you can. This blanching will help hold the color of the pesto, preventing it from turning dark. Place the pine nuts and garlic in a food processor, and pulse a few times, to roughly chop up everything. Add the herbs and the olive oil, and season with salt. Pulse until you have a fairly smooth purée. Pour the pesto into a small bowl. Fill a medium saucepan with water, and bring it to a boil. Drop in all the vegetables, and blanch them for 2 minutes. Pour the vegetables into a colander, and run cold water over them, to bring up their color. Drain well. In a large skillet, heat 2 tablespoons of olive oil over medium-high heat. Add the onion, and sauté for a minute, just to soften it. Add all the vegetables and the garlic, season with salt and black pepper, and sauté quickly, just to bring out their flavors, about 2 minutes. Finish with a squeeze of lemon juice. Divide the vegetables onto two dinner plates (or shallow pasta bowls, which work really well for this), and top them with a dollop of the pesto. You can use any leftover pesto as a topping for fish, or spread it on bruschetta, or toss it with a little pasta. What a gorgeous recipe ! Once again it seems you are reading my mind, dear Enrique. Lately I crave a single color palette of vibrant green vegetables. Never would have thought of putting tarragon in the pesto. I am quite tempted to follow your recipe to the letter, something I rarely do, and report back. I am looking forward to a “panier bio” (organic vegetable basket) from the charming Joel Thibault this weekend. I’m betting he will subconsciously deliver most of the goods needed for this glorious feast. Cheers from warm and wonderful Paris. Oh I wish I could go with you to Joel Thibault’s vegetable stand in Paris. I remember the amazing radicchio I bought from him last fall. Gather up some beautiful summer stuff for me. As flattered as I am that you’ll try to follow my recipe to the letter, I have a feeling it might not be possible. I may be wrong, but I think snap peas are not available in Europe. Am I wrong? I’ve never seen them in France or Italy, and I think of them as purely American, but let me know if you find them. But please feel free to add any gorgeous green vegetable you do find (baby leeks? That would be nice). I woke up too late on Saturday to make it to the market where Joel Thibault sells his amazing produce, so I waited until the next day to visit my local market, August Blanqui, Paris 13ème. You are right. I saw no snap peas among the many, many vegetable stands. Curiously one does find them frozen at Picards( french frozen food emporium extraordinaire), and also as a component of various other frozen vegetable medlys found at less reputable venues. Strangely missing as well – baby fennel ! Plenty of big bruisers, not looking very sprightly. So I picked up a fabulous bouquet of poivrades – little artichokes, one of which I ate raw with a vinaigrette once home. Contrary to my decree of following your recipe to the letter, I diverged big time. Fresh peas, poivrades, zucchini, a shaving of young garlic, and plenty of cébette (lovely white onions verging on having been scallions). I added separately boiled potatoes, sautéed it all in Ravida olive oil and squeezed in a bit of lemon at the end. Embellished with plenty of flat parsly – and a totally new twist for me – sarriette. A provençale herb I had only heretofore read about. At the stand where I bought my peas & artichokes (as well as montmorency cherries, which one practically never finds here in the market), the lovely farmer lady (the only real farmer at my market) foisted upon me plenty of freebies. Many extra peas, a nubile cucumber, the parsley, and a good fistful of sarriette. She warned “don’t use too much – you’ll be up all night”. And so I was. Deliciously so. So nice to hear from you today. I woke up feeling a bit blue, but now I feel green with springtime after reading your note. Your dish sounds wonderful. I like the potato addition, since they’re so great at soaking up herb and olive oil essences. Sarriette I believe is something very close to our summer savory, maybe even the same. When I get time, I’ll have to look it up. If so, yes, a very powerful herb, used to wake up bean dishes in France. I have a little herb garden on my windowsill, not much room, but I do my best. No sarriette yet, but I did plant Thai basil and it has really taken off. The aroma is superb. I’ve been adding a small handful in with my traditional Genoa style pesto and it makes the taste explode. New York is just starting to get those strange hot weather smells that you get blasted with for no apparent reason. What are they exactly? Gorgonzola? Spanish sherry vinegar? Stewed tripe? Very hard to say, but whatever they are, they’re dependable and somehow reassuring; makes you feel the city is still smoldering. A tart pan! How exciting. A lovely post and recipe…can’t wait to try it this week. I am going to the market today so I will see what is fresh. My herbs are all doing well outside so I guess it is time to try this Spring pesto! Mille grazie.